Where to start with the latest Dresden Files? The 14th in fact. This is one of the longest series I've ever stuck with. The total word output from other series I read might be longer, but this is definitely the longest number of volumes. 14 books is quite an amazing accomplishment and the fact that most are better than good is astounding. I had quite a few quibbles with the last volume, Ghost Story (reviewed here), so I started Cold Days with lowered expectations that it more than surpassed them bringing Harry back to form and thrown into the thick of all things paranormal. So my greatest fears that the series was ruined for me are unfounded at this point. Dresden awakens inside Faerie's Winter Court with new powers and new debts that must be paid. 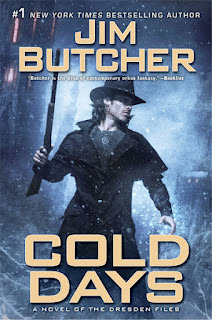 Summer Knight was the volume that made me love the series since it broadened the Dresdenverse so much and Cold Days explores the politics and inhabitants of Faerie deeper than ever before. We see Mab in all her crazy glory along with nearly every other important figure including many unexpected personages of a magical persuasion. And when Harry is given a seemingly impossible task from Mab, of course, he gets drawn into even greater problems and old grudges back in the real world. Harry has always been thought of a strong power in the past, but this supercharged version would have stomped on the young Dresden. There is still a heavy reliance on past associates including some that might have been better left out, but outside of that the action and detective work was incredible. Harry's magical island, Demonreach is vividly explored with many of its secrets finally unveiled. Cold Days more than most any other volume has payoff and reveals galore for long-term series fans. Many of the dots that have been tossed Harry's way over the length of the series are connected to great effect and seemingly disparate cases finally make sense. So if you're still hanging in there for the series, which I expect most are, Cold Days brings the series back to a nice high with plenty of laughs and things are on track for plenty more action. The prospect of 14 books is a bit daunting, but also exciting, assuming (of course) they hook me as well as they seem to have done for most readers. It definitely doesn't feel like 14 books. It rarely took me more than 2 days to read each volume. They are just addictive. Does anyone know how many more books there going to be. Butcher has gone I record saying there will be 20 case type books followed by an Epic Trilogy to close out things. So since this is book 14 that leaves 9 books total. I wouldn't be surprised if we see other Dresdenvese stories at some point. There were rumblings about an Ebenezer POV story from his youth though nothing has been said in awhile so that's probably far in the future if it happens.